Back in January I got an email from one of my favourite Indian food bloggers - Niya. She remembered a comment I made nearly a year ago about wanting to make a potato-ball curry that didn't involve deep-frying. Well, Niya came through and created one! 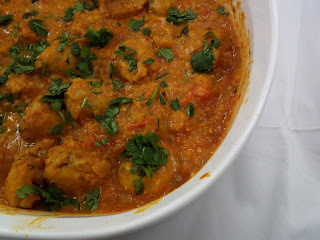 As soon as I saw Niya's Baked Aloo Kofta Curry, I knew I had to make it. Immediately. For dinner that very evening. With a few variations, I mostly doubled the recipe, and it tasted amazing. We took the leftovers to our neighbours who devoured it (and sent us some of their ribs as a thank-you). Thank you so much, Niya! In a bowl, thoroughly mix all ingredients for the kofta. Roll mixture into 1-inch balls and space evenly on parchment (should be 20-25 balls). Bake for 20-25 minutes, until slightly browned and crispy, then set aside. Combine chili powder, cayenne, coriander, salt and 1/4 cup water in a small bowl and set aside. In a deep pan, heat oil on medium-high and fry onions until translucent and browning. Add the spice and water mixture, stirring for two minutes. Add tomato paste and remaining water, stir and cover. Let simmer for 10-12 minutes and then remove from heat. Add sour cream and mix gently. Arrange koftas in a flat oven-proof dish with a lid and pour curry on top. Garnish with cilantro. Allow the curry to stand for at least one hour before serving (you can reheat in the oven) to allow the flavours to mingle. Now we are talking! what a fabulous recipe and vegetarian and gluten free to boot! Looks really delcious.. I just bookmarked! These look fantastic. Thanks for sharing. I just bought a five pound bag of potatoes to make mashed potatoes (about a once yearly thing around here) and was wondering what I was going to do with the rest of them. Thank you, thank you, thank you. I want to try this immediately. I plan to make these. I love potatoes and I love curry. This sounds absolutely delicious. I made this for Secret Recipe Club this month and we absolutely loved it! Thank you (and your friend Niya) so much for the delicious recipe.